To work with a virtual document, you must be able to identify a specific data item within it. The data item is called a virtual property. An virtual property path is the syntax that InterSystems IRIS uses to specify the location of a virtual property. Except for XML virtual documents, you can use virtual property paths only if you have loaded the applicable EDI schema into InterSystems IRIS. 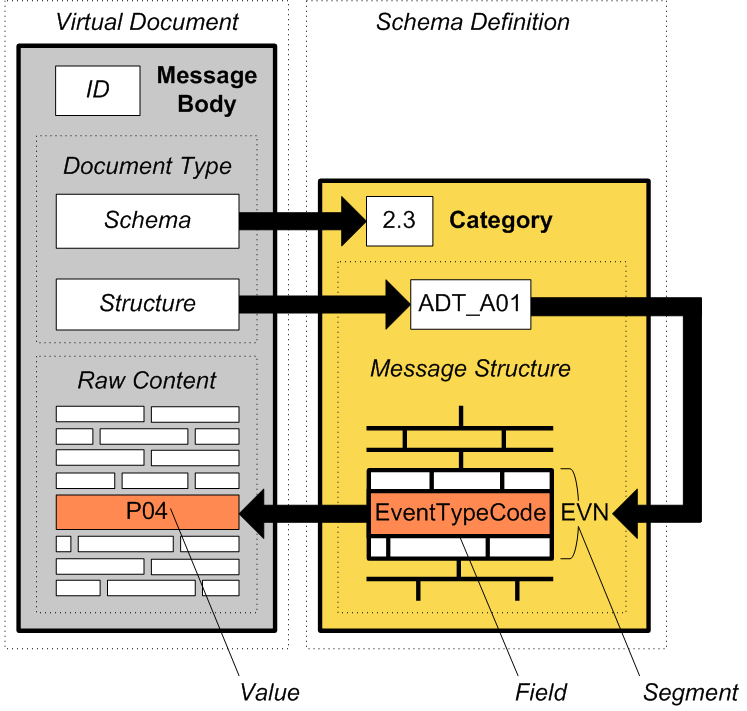 Once the schema is loaded, InterSystems IRIS has all the information necessary to parse the corresponding documents as intended by the EDI schema. Generally, an EDI standard defines a large number of possible segment structures to use as building blocks. Each document structure can contain only specific segments. Different document structures may also combine segments in different sequences or quantities. The Management Portal provides pages to help you determine the correct segment:field paths. (To access these pages, click Interoperability, and then click Interoperate.) The DTL editor also provides a view of the document structures used in a particular transformation. To work with virtual documents, there is no need to create message classes. InterSystems IRIS provides message classes, for example, one class to carry X12 documents, another for XML documents, and so on. The business host classes automatically use the appropriate message class. Use the macro $$$ISOK(myX12Message.BuildMapStatus) in ObjectScript and the method $SYSTEM.Status.IsOK(myMessage.BuildMapStatus) in Basic. If the test returns a True value, BuildMapStatus contains a success value. Use the macro $$$ISERR(myMessage.BuildMapStatus) in ObjectScript and the method $system.Status.IsError(myX12Message.BuildMapStatus) in Basic. If the test returns a True value, BuildMapStatus contains a failure value.